Leading provider of all-natural anti-aging skincare brand, Born Skincare, is participating in The Yoga Marketplace, featuring the latest in yoga apparel, accessories, jewelry, nutrition, natural health and beauty vendors and services. Born Skincare is proud to be a supporter and vendor at The Yoga Market September 18th-21st in Colorado during Yoga Journal LIVE, a top-notch educational opportunity for yoga practitioners of all levels from all over the world. Attendees will explore new styles, get inspired and connect with a roster of highly regarded yoga teachers and luminaries, according to its website. The Source for Muscles boasts its star ingredients, muscadine oil, to help relieve sore muscles, inflammation, neck and back pain. Muscadine oil is rich in nutrients and is miraculous for body aches and pains because of its natural anti-inflammatory formula. It’s great for athletes, especially yogis to recoup their muscles for their practice. 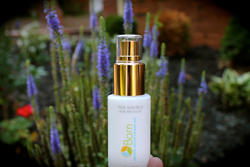 Using all natural ingredients, The Source collection provides anti-aging solution for all skin types. Customers can shop the all-natural skincare line online at http://www.bornskincare.com/our-products/. Born Skincare products promise certified ToxicFree and Cruelty-Free formulas with results that leave skin feeling smooth, hydrated and youthful.